2 Bedroom Apartment To Rent in Caterham for £1,595 per Calendar Month. Situated in the heart of Woldingham is this newly built 2 bedroom ground floor luxury apartment, with private terrace and off street parking. The apartment consists of an open plan living and dining space with oak and walnut flooring and patio doors opening out onto a decked terrace, which overlooks the communal grounds. 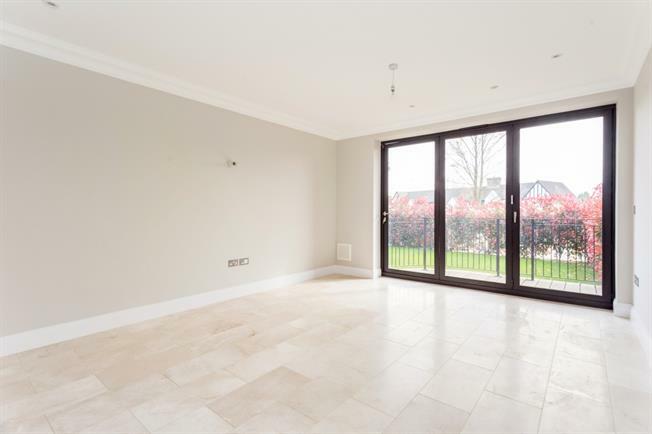 Within this space there is a fully fitted open plan kitchen by TM Italia, with Miele appliances and a Siemens washer/dryer and marble flooring. Both bedrooms feature Italian fitted wardrobes and the same oak and walnut flooring that features throughout. The master bedroom has the added benefit of an Italian design en suite bathroom. There is a further shower room that services the second bedroom, with a rain water shower and marble tiles and floors. The apartment has an enviable location in the heart of the village within walking distance of the shop/post office, green, church, primary school, village hall, tennis club and recreation ground. Woldingham lies on top of the North Downs and is designated as an area of outstanding natural beauty. There are two golf courses, a village club and local schools including a village primary school, Hazelwood, Woldingham and Caterham schools. TRAIN SERVICES: Woldingham Station is 0.9 miles and has regular services to London Bridge (38 mins) and London Victoria (35 mins). There is easy access to the M25 (Junction 6) approximately 4? miles away. The apartment has a decked private terrace with a wrought iron fence and overlooks the communal lawns. The development is accessed via security gates with a driveway leading to a parking area with LED bollard lighting. The apartment benefits from an allocated parking space. There are also two visitors spaces and two disabled parking spaces.